Welcome Our Newest Star, Nyota! 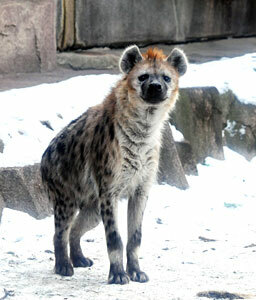 Nyota was acquired from the Buffalo Zoo to provide companionship for our male hyena, Scruffy. Hopefully, they will produce offspring in the future! Hyenas, native to the Sub-Saharan regions of Africa, have a very complicated communication and social system with over 14 unique vocalizations. In the wild, they live in clans of up to 80 members so the ability to communicate is very important! Also, females tend to be more dominant over males with a social structure similar to baboons. You can visit new companions Nyota and Scruffy daily, in the Florence Mila Borchert Big Cat Country Exhibit. Please note that the hyenas and lions do rotate on public exhibit, so they may not always be visible.